Better late than never, here’s a review of the October group show by SF|Tribal, an association of Bay Area dealers. This year the event, entitled Primal at the Presidio, had a superb venue (Herbst Pavilion), for the weekend show and opening party. Numerous prominent dealers in fine Indonesian textiles and artefacts were exhibiting, including Tom Murray, Joe Loux, Andres Moraga, Vicki Shiba, Frank Wiggers, Erik Farrow, Michael Auliso. 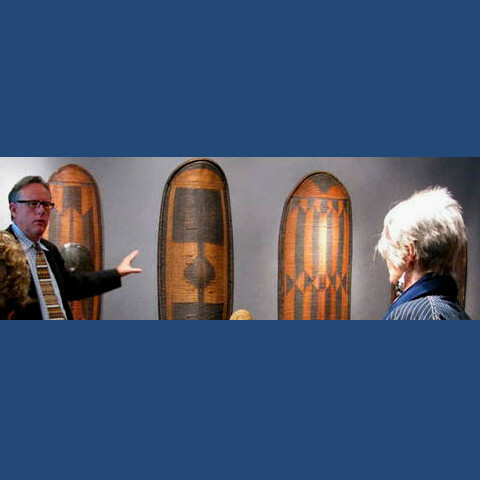 There’s Tom (below) with tribal and textile expert, Cathryn Cootner who guided a morning sneak preview walk-through for collectors and scholars. Here’s a list and details about the SF Tribal dealers. As a footnote, Tom was just here in Bali, and we had a very cordial chat with him during the vernissage at Biasa Artspace on Monday. No explanation of his off-season visit to Bali was given. Tom works in mysterious ways.